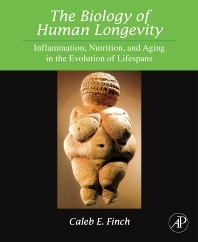 Written by Caleb Finch, one of the leading scientists of our time, The Biology of Human Longevity: Inflammation, Nutrition, and Aging in the Evolution of Lifespans synthesizes several decades of top research on the topic of human aging and longevity particularly on the recent theories of inflammation and its effects on human health. The book expands a number of existing major theories, including the Barker theory of fetal origins of adult disease to consider the role of inflammation and Harmon's free radical theory of aging to include inflammatory damage. Future increases in lifespan are challenged by the obesity epidemic and spreading global infections which may reverse the gains made in lowering inflammatory exposure. This timely and topical book will be of interest to anyone studying aging from any scientific angle. Biomedical scientists and clinicians in areas of vascular disease, diabetes-obesity; Alzheimer disease and neurodegenerative disease; genetics; invertebrate models of aging; primatology; evolutionary biology; demography; epidemiology. It is also applicable for graduate courses in biogerontology. Chapter 1: Inflammation and oxidation in aging and chronic diseases. Chapter 2. Infections, Inflammogens, and Drugs. Chapter 3. Energy balance, inflammation, and aging. Chapter 4: Nutrition and Infection in the Developmental Influences on Aging. Chapter 5: Genetics. Chapter 6: The human the life span: present, past, and future. Dr. Finch’s major research interest is the study of basic mechanisms in human aging with a focus on inflammation. He has received numerous awards in biomedical gerontology, including the Robert W. Kleemeier Award of the Gerontological Society of America in 1985, the Sandoz Premier Prize by the International Geriatric Association in 1995, and the Irving Wright Award of AFAR and the Research Award of AGE in 1999. He was the founder of the NIA-funded Alzheimer Disease Research Center in 1984 and currently serves as co- Director. Dr. Finch became a University Distinguished Professor in 1989, an honor held by sixteen other professors at USC who contribute to multiple fields. He is a member of five editorial boards and has written four books including The Biology of Human Longevity (Academic Press 2007) as well as over 470 articles.